Explore our Library! We Have Lots of Study Spaces! What kind of study space do you need to ace those tests and projects? Group Study Space? We have that! Working on a group project and need that space to spread out and maybe even have a white board? We have 2 study pods – one of which has a Media:Scape. Both the Media:Scape cable ports and adapters and white board markers are available for check out at the circulation desk. There is a sign-up sheet on the door of each pod. It is a 2-2-2- policy: 2 or more students, 2 hour time slots, and you may reserve your spot up to 2 days in advance. 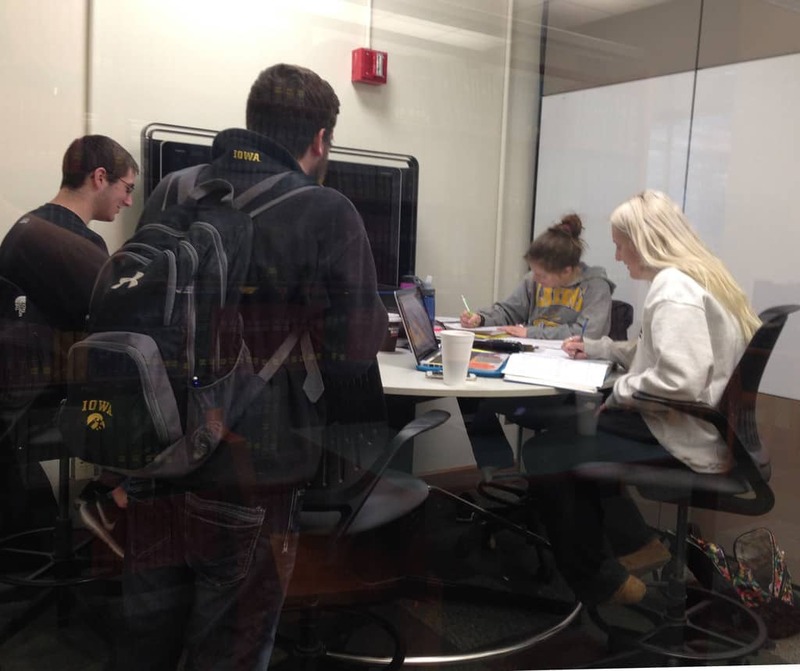 Besides the 2 group study pods we have four group tables which are another option for working together on a group project. Quiet Study Space? We have that! Need a quiet space away from roommates and other distractions? We have the perfect area! Our lower level is a dedicated quiet space. There are over 30 individual study carrels. 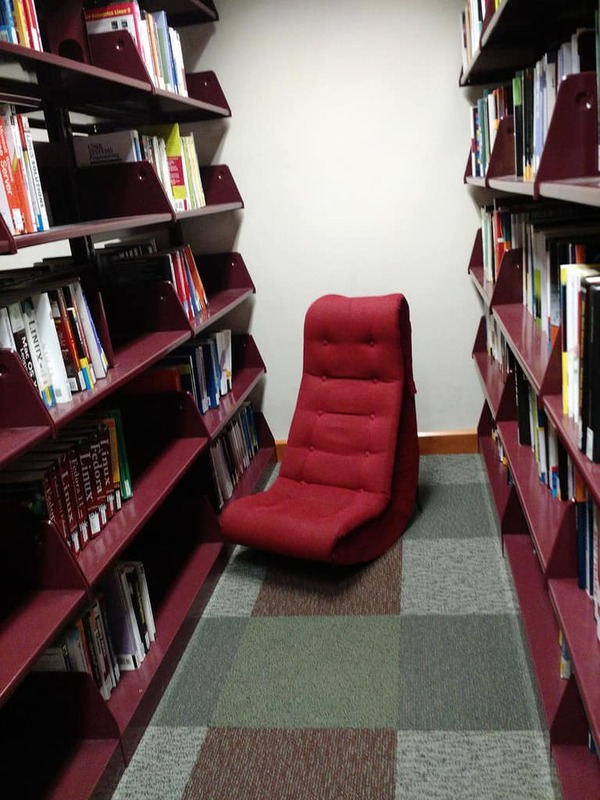 If you are tired of sitting at a desk, we’ve got several easy chairs where you can sit back and relax while you cram for that midterm. Bean Bag Chairs? Gamer Chairs? Yup, we have them! Also in the lower level, we have comfortable bean bag chairs and gamer chairs. They are the perfect spot to catch up on that required reading you haven’t done yet…. Study Carrels? We have them! Besides the study carrels in the lower level, there are 4 on the main level, too. 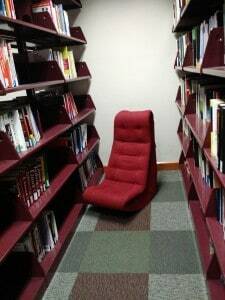 The upstairs study carrels are close to the printers and scanners so they are easily accessible. Need an ITC computer? We have those! We have 20 computers (plus new computers tables and chairs) on the main level, and 12 more in the multipurpose room. Plenty of spaces where you can come to study! Printers & Scanners? We have those, too! All our computers and your laptops will print to the 2 print stations. We also have 2 scanners – so it is easy to scan documents and save to a thumb drive or email them – easy way to share information to project partners and keep an electronic copy! Whenever you need a change of scenery from your dorm or apartment, come study with us! And good luck on those midterms! New Exhibit: Creating a Terror-ific Halloween! DIY for the Weekend! Learn Game Development Programming!